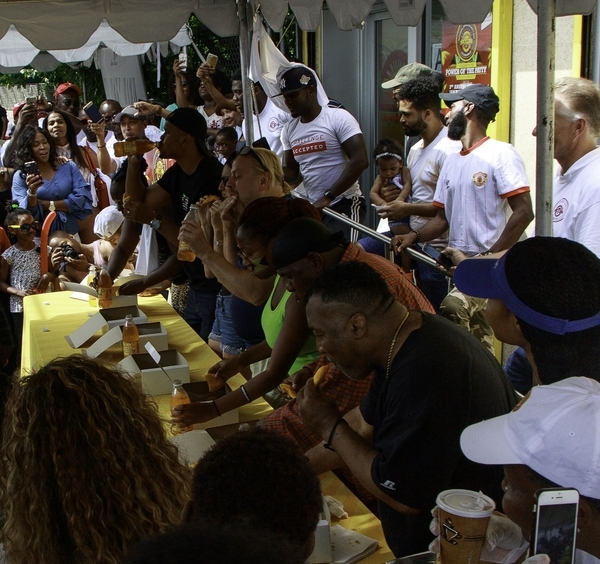 Golden Krust served over 1,000 patties to 1,000 people in a festive fun setting at the 3rd Annual National Jamaican Patty Day. BRONX, NY, August 10, 2017 /24-7PressRelease/ — On Saturday, August 5th, 2017 Golden Krust Caribbean Bakery & Grill (GK), the nation’s largest Caribbean franchise chain, celebrated their 3rd Annual National Jamaican Patty Day with over 1,000 patrons having free samples of freshly baked patties & jerk chicken, while enjoying live reggae music. Celebrations took place at stores nationwide, with Golden Krust locations selling 99-cent beef patties from 11:00am to 3:00pm. WBLS’s Dahved Levy kept the large crowd rocking from 12pm – 5pm alongside the Royal Khaoz band. Celebrity Chef Andre Fowles, two-time winner of Food Network’s Chopped, hosted an entertainingly informative cooking demonstration, showcasing a delicious roasted shrimp pasta, in a callaloo-cream sauce, with a jerk-parmesan crumb. Bronx District Attorney Darcel Clark stopped by the Celebration to congratulate Golden Krust on serving the community for over twenty-five years, as well as delivering an encouraging message to the audience. NYPD’s finest also took part in the patty-party. Patrons took advantage of a quick, free health-checkup at the Morris Heights Health Center tent, while children took pictures in the photo booth with their faces painted enjoying cotton candy. Bronx native Jeanette Bell stole the show, as she proudly took the crown as the winner of the 2017 Patty Eating Contest in impressive style. The Patty Day Getaway Sweepstakes is still live on Golden Krust’s Facebook & Instagram accounts, winner receives two round-trip tickets to Jamaica courtesy of JetBlue. Winner slated to be announced on Sunday, August 13th, 2017. National Jamaican Patty Day is celebrated on the first Saturday in August, annually. The month of August is significant to Golden Krust for a myriad of reasons. Jamaica celebrates both Emancipation and Independence holiday’s in the month of August. Further, Golden Krust first opened its doors for business in August of 1989. Additionally, Mavis Hawthorne, the matriarch of the Hawthorne family, was born in the month of August. Golden Krust Caribbean Bakery & Grill, Inc., www.goldenkrustbakery.com, is a Caribbean food chain. Founded in 1989 by Lowell Hawthorne and his family, Golden Krust headquarters is located in Bronx, NY and has 120 stores nationwide. For twenty-six years, Golden Krust has brought food lovers a taste of the Caribbean through franchising and a thriving retail business through which Jamaican style patties are distributed to supermarkets and club stores nationwide as well as through several food service organizations.